Highly visible, laser-etched mm scale. Robust handle with soft, comfortable grip inlays. An adjustable spanner or wrench is a handy tool for undoing or tightening hexagon head nuts, screws and bolts. Professional fitters and tradesmen could hardly manage without this handy tool, and an adjustable spanner is a valuable addition to any DIY enthusiast's tool box. The jaws of an adjustable spanner can be opened and closed to fit various sizes of nuts and bolts. 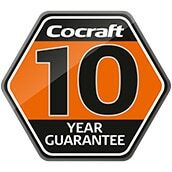 This Cocraft adjustable spanner is made of high quality, durable chrome vanadium steel. Equipped with a robust handle with soft, comfortable grip inlays. Clear laser-etched mm scale which is easy to read.